Dr. William Doyle White, 80, of Searcy, Ark., died Saturday, Oct. 6, 2018, at Unity Hospital in Searcy. He was born July 15, 1938, the son of S.D. White, Jr. and Estelle (Welch) White. He was a member of the College Church of Christ, where he served as an elder and song leader for many years. His commitment to God inspired his attention to words and music that best fit the theme of the sermon, and he spent many hours selecting songs most appropriate to the day�s worship. He gave of his heart, his time and his personal skills to mentor and minister to those who came to Monday night Caring & Sharing and the medical clinic at His House, as well as one-on-one sessions with many who sought his counsel. Bill was a graduate of Central High School in Little Rock, Arkansas, Class of �55. He earned a bachelor�s degree in music at the University of Arkansas in 1959. From the second semester of his freshman year until his graduation in 1959, he was selected for a lead in all musical theatre productions and operas produced by the department. An avid runner, he lettered in track and field in high school and college and later ran numerous marathons, including the well-known Boston marathon. On June 27, 1959, Bill married Neva Jane Cram, a music graduate he had met at the University of Arkansas, and whose piano prowess earned numerous accolades as a performer and accompanist. They were married for 53 years before her death. To this union were born Mark, Jonathan, Stephen, Laura and David. He attended medical school at the University of Chicago, from 1959 until 1963. During medical school, he continued to pursue his interest in music at the Music Conservatory, singing a lead role in Rigoletto and other operas, and performing with the Lyric Opera Orchestra and Chorus at the Apollo Opera Company. He was chosen the Outstanding Male Vocalist under 30 in Chicago and sang an aria with the Chicago Symphony. He once served as a judge for Metropolitan Opera competitions. Even as a practicing physician, he performed numerous solos with the Arkansas Symphony, the Arkansas Choral Society, Opera Memphis, the Harding University orchestra and chorus, and in many regional symphonies and oratorios. After graduating medical school, Bill completed a one year internship at UAMS in Little Rock, and then served the United States Public Health Service as a commissioned medical officer with the Indian Health Services hospitals in Pawnee and Claremore, Okla., until June 1967. He then returned to UAMS to complete residency in internal medicine and fellowship in gastroenterology at the University of Arkansas for Medical Sciences. He moved to Searcy in 1970 to begin his practice. 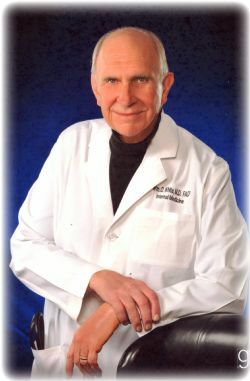 Bill�s medical practice spanned 48 years, including service as team physician for the U.S. Olympics women�s volleyball team and men�s boxing team in 1979; medical director for Track & Field National Finals for several years; 20 years in internal medicine and gastroenterology at Searcy Medical Center; team physician for 17 years for Harding University and Harding Academy football teams; professor of medicine and associate dean of the College of Health-Related Professions at the University of Arkansas for Medical Sciences; associate chief of staff at the Veterans Hospital in Little Rock; and medical director of Harding University�s Physician Assistant Program. He was preceded in death by his parents; his beloved wife, Neva; and an infant son, Stephen. Survivors include his children � Mark (Connie), Jonathan (Cheryl), Laura (Gary) Eads, and David (Katy); nine grandchildren � Grant (Natalie) White, Cara (Andy) Sills and Garrett (Jenna) White; Emily Eads, Ethan Eads and Easton Eads; Taylor White, Carson White; and Gabriel White; five great-grandchildren � Roxie White, Jaxson White, Adalynn White; Palmer Sills and Wyatt Sills. A celebration of the life of Dr. Bill White will be Thursday, Oct. 11, at 10 a.m. at the College Church of Christ in Searcy, with visitation Wednesday, Oct. 10, from 4 to 6 p.m. in the College Church family room. Pallbearers will be Grant White, Andy Sills, Garrett White, Ethan Eads, Carson White, Easton Eads and Gabriel White. In lieu of flowers, memorials may be made to Partners in Progress at http://partnersinprogress.org.